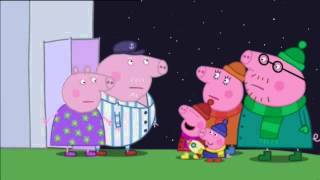 The Stars in the night sky are far away and seem so tiny until Daddy Pig helps Peppa and George spy them through a telescope. Then, bedtime at Cousin Chloé’s turns into The Noisy Night when Baby Alexander’s crying keeps everyone awake! Peppa’s family takes A Trip to the Moon when they visit the museum’s out of this world exhibition. And see what special surprise Peppa and George have in store for Daddy Pig’s Birthday!